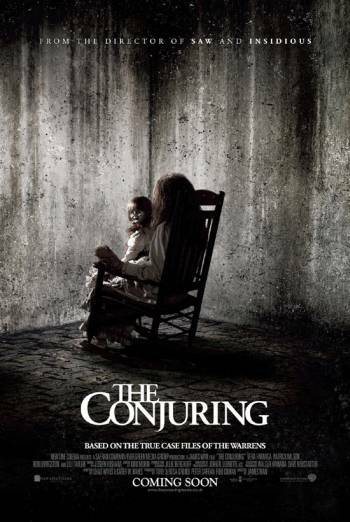 THE CONJURING is a horror film about a family who are tormented in their farm-house by the ghosts of its former inhabitants. It is rated 15 for strong horror. There is strong horror throughout. For the first half of the film, the cause of the threat is unseen and the family at its centre are subjected to all manner of whispers, chills and things that go bump in the night. Pictures fall from the walls and the television turns on by itself. In one scene, one of the five daughters is convinced she has seen something in the bedroom she shares with her sister. She says she sees something in the shadows and the door slams suddenly. After the tension has been created in this way, the threat becomes real when a woman with a pale and blood streaked face jumps off the top of a wardrobe onto one of the girls. The demon spirit is attempting to possess the girls' mother, and leaves large red bruises on her body before it appears above her on a bed and vomits blood into her mouth. From this point, the horror is more physical as we see members of the family thrown around the room by their hair and lured into danger. We also see further ghosts, with a woman seen hanging from a tree and a maid appearing to an investigating policeman, showing him bloody incisions on her wrists. The mother attacks one of her daughters with a huge pair of scissors but is restrained by the ghost hunters who have come to attempt an exorcism . At one point the woman lashes out at a policeman with the scissors and takes a chunk out of his cheek. She is then restrained under a sheet, which become spattered with blood from the inside as the demon tries to escape. There's lots of blood from the possessed woman's mouth and her face is covered with red veins. The bloody horror is strong, but the threat is fantastical rather than rooted in the real world.